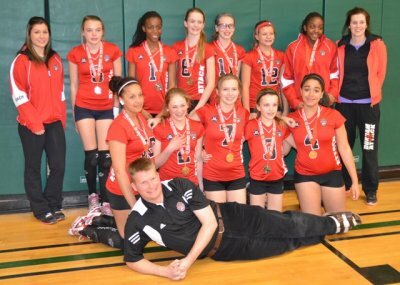 Durham Attack 13U Girls Reign the Medal Podium in Ottawa! 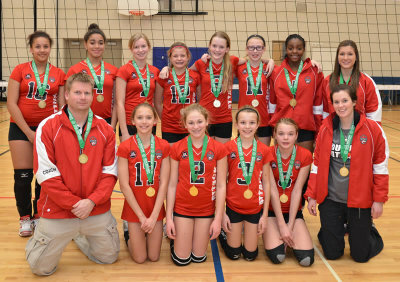 January 31, 2013 Durham Attack 13U Girls Reign the Medal Podium in Ottawa! All three 13U Girls teams travelled to Ottawa for the 13U Girls Challenge Cup, Trillium Zone F, on January 26, 2013. The scary drive through the snowstorm Friday afternoon was worth it! The teams did the Club proud with their excellent play and great teamwork and attitude! After very successful Pool games, Attack Smash met Attack Fire in the Semi Finals, and played hard-fought games that were by far their most exciting competition of the day. 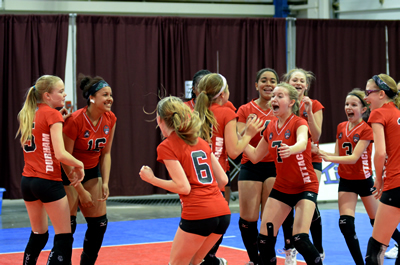 Smash won the semi-final, and then dominated the Gold medal game against Ottawa’s Mavericks Rattlers in two straight games 25-7 and 25-9, meanwhile Fire dominated the Bronze medal game against Ottawa Fusion Black 25-9 and 25-13. The two Attack teams met again in the Medal ceremony and celebrated their success with a triumphant combined “Olé Olé Olé” cheer! 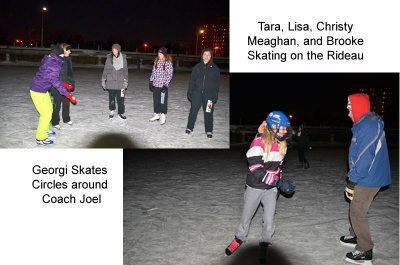 A fun time was had by all at their first overnight trip together, including skating on the Rideau Canal at night! Girls 13U Smash Win First Gold!! 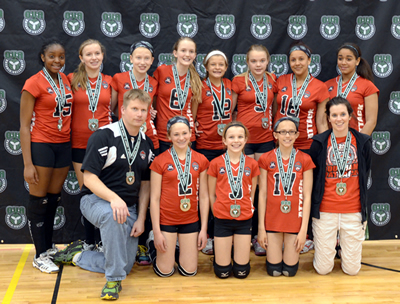 January 21, 2013 Girls 13U Smash Win First Gold!! After two very respectable 5th place finishes in their first two tournaments together as a team in the fall, the Girls 13U Smash declared “It’s GO TIME!” in the New Year, and “Smashed” their way to their first Gold Medal, playing up in the 14U Challenge Cup Trillium E division held at Markham District H.S. this past Saturday January 19th. 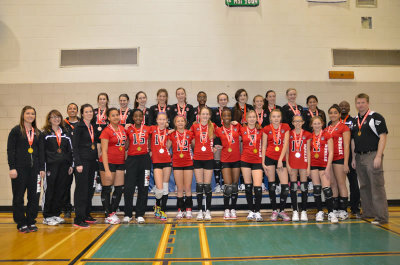 Despite a slow match at the start that challenged their rhythm, they gained momentum after early success and were undefeated against all of their opponents, including Markham Stingers Gold, VC Troyka, Leaside Lightning, Queen B, and won the gold medal match in two straight sets against Markham Stingers Black. Every single player made a solid contribution to the team’s success, and the excitement and cheering of all the players, coaches and parents made for a thrilling first medal experience for everyone! Thanks to Coach Joel Banbury for his amazing coaching that brings out the best in everyone, and to Assistant Coaches Kristy Moore and Brook Luchka, who all led the team to their first big success. Congratulations to all the players: Christina Antoine, Jade Butterworth, Victoria Chambers, Tara Hawley, Sydni Kelly, Kansas MacKay, Rebecca Partridge, Allison Prinzen, Megan Reddon, Kate VanCamp, Georgi Williams, and Annissa Sebastien (who was with the team in spirit even though she was sick & unable to play!). 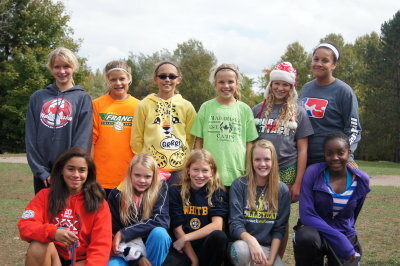 The Durham Attack U-13 Girls Smash team recently took on a challenge together to help the community they play in. The team took up a collection of clothing for the Durham School Winter Food for Clothing Drive, which was held Saturday November 3 at Village Union P.S. in Oshawa. Twelve big bags of clothing were collected and delivered to the school to a very appreciative response. The girls’ “Smash” team spirit came through and showed how big an impact they can make when they work as a team! A news story about this annual event can be read at this link. According to the article, while there was an increase in the number of people seeking clothing, there was a drop in donations this year, so keep this clothing drive in mind when cleaning out our closets next year!